Quetzalcoatl - God of wisdom, life, and knowledge. - Aztec God. Quetzalcoatlfeathered serpent is the God of wisdom life knowledge morning star fertility patron of the winds and the light the lord of the West. 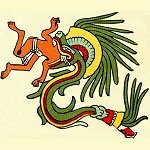 Home ¦ Divinity of the Day ¦ Aztec Gods and Goddesses ¦ Quetzalcoatl - God of wisdom, life, and knowledge. Quetzalcoatl - God of wisdom, life, and knowledge. Quetzalcoatl("feathered serpent") is the God of wisdom, life, knowledge, morning star, fertility, patron of the winds and the light, the lord of the West. Quetzalcoatl was related to gods of the wind, of Venus, of the dawn, of merchants and of arts, crafts and knowledge. He was also the patron god of the Aztec priesthood, of learning and knowledge. He is usually depicted as a serpent or feathered serpent.